It’s finally here: Election Day 2016. 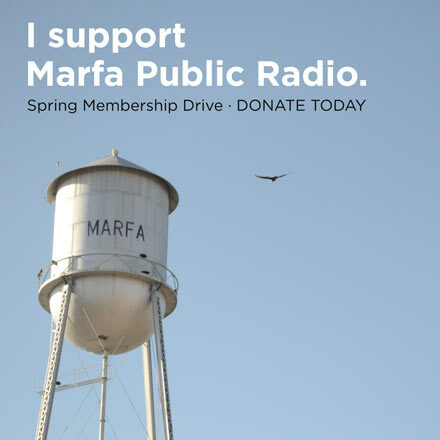 Marfa Public Radio is bringing you live special coverage of national, statewide, local and regional races throughout the evening. Listen at 93.5 FM in West Texas or online. After the polls close in Texas at 7 PM, we’ll have live election returns from the Texas Tribune below, along with a live-blog at the bottom of this post from our news team and reporters at public radio stations across the state. 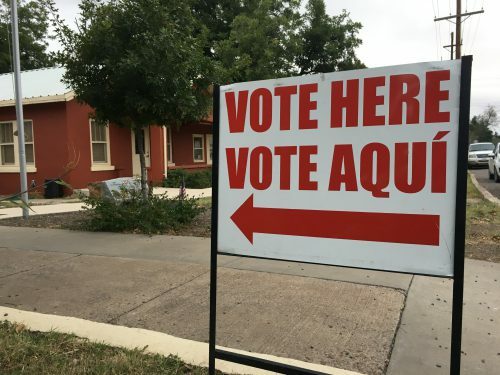 Most local-level races in West Texas only had one political party represented in the March primary, so those races have already been decided. Among the few local competitive races in West Texas we’re following this evening is the rematch in the Texas 23rd Congressional District between incumbent Republican Will Hurd and Democrat Pete Gallego, former 23rd district representative himself. The race is notable for being the only competitive congressional race in Texas this year. National political groups have been particularly interested in the race, pouring large sums of money into television ads for both Gallego and Hurd throughout the campaign season, and Donald Trump’s presence at the top of the ticket has been a key part of the race. Ponton is now running as a write-in candidate for Presidio County Attorney, as is Chuck Stephenson. There are no candidates already on the ballot for that position. In the Permian Basin’s 11th Congressional District, incumbent Republican Mike Conway is facing a long-shot challenge from Libertarian candidate Nicholas Landholt. Democratic State Senator Carlos Uresti is hoping to keep his seat in District 19 against Republican challenger Peter Flores. The district covers Brewster, Reeves and Pecos Counties and runs the border east to San Antonio. In Jeff Davis County, the race is on for county sheriff/tax-assessor-collector between Democrat Ken Watson and Republican Bill Kitts. The two candidates are vying to replace current sheriff Rick McIvor, who is not running for re-election. In Brewster County, incumbent Democratic Precinct 1 Commissioner Luc Novovitch is facing a challenge from Republican Betse Esparza. In Midland County, two county commissioner seats are up for grabs. In Precinct 1, Democrat Amanda Rosales and Republican Scott Ramsey are vying to replace current commissioner Jimmy Smith, who isn’t running for re-election. In Precinct 3, Democratic incumbent Luis Sanchez is being challenged by Republican Lynn Yarbrough. 5:45 AM – Election Day results for Presidio County did not come in on Election Day, but after reviewing them this morning, Republican Sandy Wilson is the winner in the 83rd District Attorney race against Democrat Jaime Escuder. Wilson netted 6156 votes to Escuder’s 4855 across the Big Bend. 6:00 AM – 83rd District Attorney Rod Ponton has won a write-in-only race for Presidio County Attorney. 7:10 AM – The Texas Tribune is reporting that Republican 23rd District Congressman Will Hurd has retained his seat against Democrat – and former 23rd rep himself – Pete Gallego, making Hurd the first incumbent in years to be re-elected in what had been a swing district in recent years. Gallego won over voters in Presidio County, but voters favored Hurd in Brewster, Jeff Davis and Pecos Counties. 7:20 PM – Early voting results are starting to trickle in from the Big Bend region. In early voting in Jeff Davis County – home to Fort Davis and Valentine – voters have gone with Donald Trump for president over Hillary Clinton – 501 votes for Trump to 297 for Clinton. Early voters in Jeff Davis County also sided with the Republican incumbent for the Texas 23rd Congressional District race, Will Hurd, over Pete Gallego – 464 to 352. 7:30 PM – Early voters in Ector County – home to Odessa – voted for Trump over Clinton, 71.8% to 25.4%. No big surprises here, as the Permian Basin is a staunchly conservative part of Texas. 7:35 PM – Early voters in Presidio County – home to Marfa, and historically one of Texas’ few solidly blue counties – have gone for Hillary Clinton over Donald Trump, 1119 to 327 votes. Again, no big surprise here. Presidio County early voters have also gone for Pete Gallego over Will Hurd in the TX-23 race by a large margin – 1005 to 389 votes. 7:50 PM – Election day results are starting to come in across the Big Bend. With 1 of 9 precincts reporting in Brewster County, Donald Trump is winning over Hillary Clinton. In 2012, Mitt Romney narrowly took the county over Barack Obama. 7:50 PM – In the 83rd District Attorney’s race between Democrat Jaime Escuder and Republican Sandy Wilson, Presidio County early voters went for Escuder – 849 to 470 votes. In Jeff Davis County, early voters chose Sandy Wilson over Escuder – 507 to 299 votes. 7:55 PM – Early voters in Jeff Davis County go for Republican Bill Kits over Democrat Ken Watson for county sheriff – 606 to 236 votes. 8:00 PM – Early voters in Brewster County showed some mix political allegiances, with early voters choosing Donald Trump for president over Hillary Clinton – 1543 to 1352 votes, but choosing Democrat Pete Gallego over incumbent Republican Will Hurd in the TX-23 Congressional District race – 1584 to 1446 votes. 8:25 PM – Early voters in Midland County easily went for Trump over Clinton. In the Midland County Commissioners races, early voters are for Republican Scott Ramsey over Democrat Amanda Rosales – 7013 to 1680 votes. 8:45 PM – Still no election day results from Big Bend counties, but in early voting for the 83rd District Attorney Race, Democrat Jaime Escuder has Presidio County, while Republican challenger Sandy Wilson has Brewster and Jeff Davis Counties. Still no early or election-day returns for Pecos County, the fourth county voting in that race. 9:22 PM – Election Day results for West Texas counties are still not in, but in early voting, Republican Sandy Wilson is leading against her Democratic opponent in the 83rd District Attorney race in the Big Bend. Wilson is up across Brewster, Pecos, Jeff Davis and Presidio Counties in early voting – 4447 to 3449 votes. 9:26 PM – In the Permian Basin’s rural Martin County – home to Stanton – the county has a constable for the first time in several years, according to our stringer reporter Lana Straub. Straub reports Lovelle Floyd won 617 votes to write-in candidate Jimmy Mitchell’s 67 votes. 10:00 PM – Democratice candidate for 83rd District Attorney Jaime Escuder tells KRTS his deficit in the Big Bend region is “probably an insurmountable one.” Republican Sandy Wilson leading in early voting in Brewster, Jeff Davis and Pecos Counties, and in election day voting in Brewster, Jeff Davis and Pecos Counties as well. As of 11 PM, Wilson was leading Escuder by about 1500 votes across the Big Bend region, likely a winning lead for her. “But I do think, unfortunately, that Mr. Trump, he tapped into something in people that’s unfortunate, but that resonated, and I do think that some of that affected other races, including mine,” Escuder says. 10:20 PM – Republican Bill Kits wins county sheriff race against Democrat Ken Watson. 10:40 PM – Democratic incumbent Brewster County Commissioner, Pct. 1, Luc Novovitch loses his seat to Republican challenger Betse Esparza – 776 to 478 votes. This entry was posted in KRTS News and tagged Election 2016, Local Elections, politics, Presidential Election, Texas Politics, Voting, West Texas Politics. Bookmark the permalink.